LMN Architects have added another performing arts facility to their portfolio. 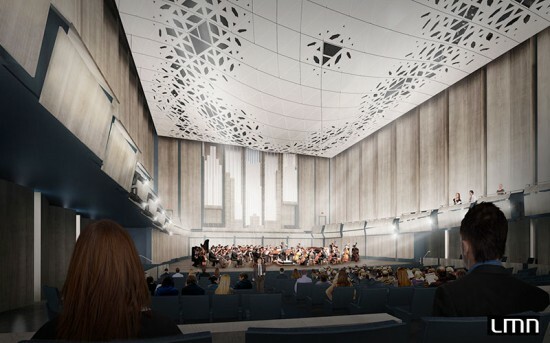 This one is the School of Music Building, University of Iowa: 700 seats, 946 unique acoustic panels. The building's concert hall features a suspended acoustic ceiling canopy. Its intricate latticework provides strategic openings for the audio speakers, stage and house lighting, the fire sprinklers, while concealing the structural truss work. To visualize the concert hall, LMN fabricated a three-foot scale model, plus a few full-sized components, on the firm's 3-axis CNC mill. Many consultants contributed to the design using different digital formats. The acoustical consultants used SketchUp. The lighting designers used Revit. The theater and audio/visual consultants saved their specifications as DWG files. All of these programs were compatible with Rhino and, using Rhino's Grasshopper plug-in, LMN was able to incorporate all the consultant's information. The project resulted from the damage of the 2008 flood and is now expected to be completed in 2016.